In the greatest movie ever made, The Empire Strikes Back, Luke Skywalker is unpacking his belongings on the swamp planet of Degoba after crash landing his X-wing fighter. He had been instructed by the spirit of Obi-Wan Kenobi to go there to learn the ways of the Force. Skywalker sits down to enjoy a snack when he is startled by a little green creature that we soon learn is the great Jedi Yoda. Before this is revealed, the diminutive swamp dweller creates quite a commotion in the camp, during which he takes a bite of the snack that Skywalker left laying on a box. 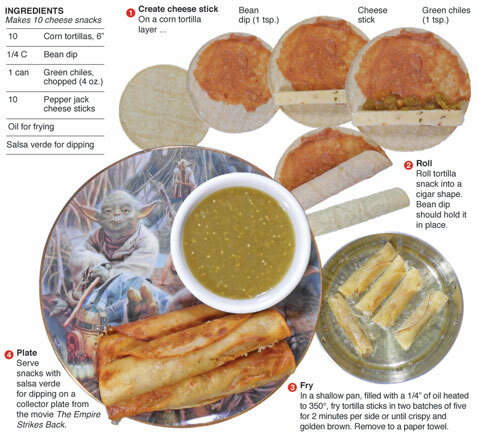 For this recipe, I create my version of that snack had I been working for Star Wars creator George Lucas during the filming of this cinema classic. 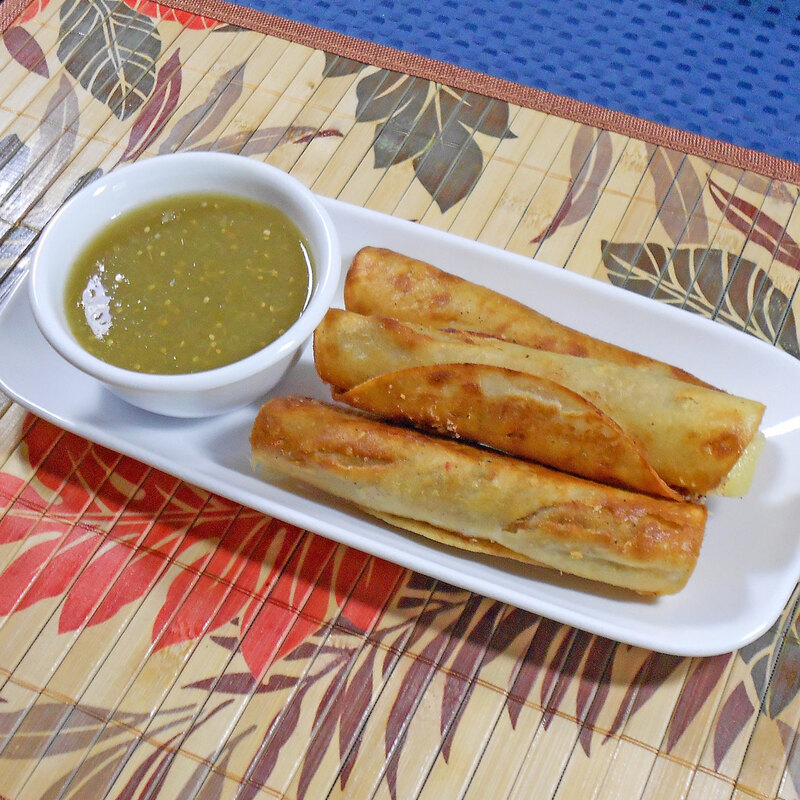 It’s a corn tortilla with bean dip and green chiles, wrapped around a cheese stick, crispy fried and served with salsa verde. It’s a tasty treat and hardy nourishment for anyone training to become a Jedi. May the Force be with you, always. I am a Star Wars geek through and through. I remember seeing Star Wars at a drive-in movie theater when I was 4 years old. 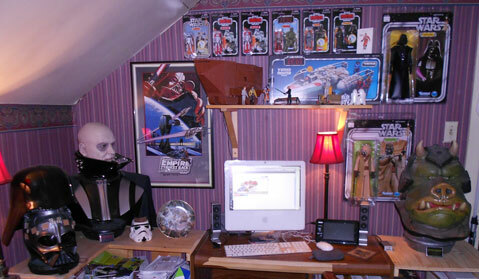 Every Christmas and birthday until I was 13 my wishlist was full of the latest Star Wars vehicles or action figures (I called the figures "Star Wars guys"). The original trilogy was more than just a collection of great movies, it was a fantasy world that I could explore over and over agian with the figures, playsets and vehicles. The creativity of George Lucas inspired my young imagination, not just through the movies but with the toys that I gleefully opened and played with every Christmas. Computer work station in my office, surrounded by inspiring collectibles. I collect vintage trilogy merchandise to this day. You could call it a passion. In my office, where I document and create the recipes for my food column and blog, Star Wars has a place. It's only a fraction of the collection I have amassed but it's a constant reminder to think outside the box. I've earned a good living as an adult based on my creativity. That spark was planted and nurtured by the ideas of George Lucas. There are many other influences on my imagination, but Lucas and the Star Wars universe was a major contributor. I will always be a fan, geek or whatever you want to call a grown man with a Star Wars collection – and I am proud of it. On September 16, the Star Wars film collection will be released on Blu-ray. If you have little ones in your life, maybe it's time to pick up the box set and introduce them to a galaxy far, far away. Haha! I love it! It looks delicious. Thaks for all your amaizing recipes. Love this one too. Spicy Chicken Stir Fry, Anytime!